The question can be put another way. Is London a bottleneck? Whether it be road, rail or air transport the United Kingdom´s capital city has its limits to absorb the influx of all the transport demands made on it. The period of rapid growth in transport infrastructure in Great Britain was in the nineteenth century with the construction of the railways. All of the different companies wanted to have a terminus in or near the centre of the capital. That leaves us with a legacy without comparison. Paddington, Marylebone, Euston, St.Pancras, Kings Cross, Moorgate, Liverpool Street, Fenchurch Street, London Bridge, Cannon Street, Blackfriars, Waterloo, Charing Cross and Victoria - 14 mainline rail termini, without mentioning those that have disappeared such as Broad Street. Some were even a terminus for more than one rail company such as Victoria(the London, Brighton & South Coast Railway, with the London Chatham & Dover Railway),and London Bridge (the London & Greenwich Railway, shortly followed by the London & Croydon Railway, The London & Brighton Railway and the South Eastern Railway - the Croydon and Brighton companies merged in 1846 to form the London Brighton & South Coast Railway). This is a legacy unrepeated anywhere in the world. In Paris there are far fewer termini while other capital cities have through stations and not termini. Historically this is very interesting but for passenger flows to final destinations it makes movements very awkward. People still had to walk, ride(in Hanson cabs) or bus it to their destinations or between termini. Thus one of the enabling factors was created to stimulate the need for an inner city transport system which became the Underground(LUL). The very first line was to connect Paddington in the west to the City of London past the northern termini, where possible. This was later completed by connecting the southern termini on the north bank of the Thames, and eventually rounded to make the Circle Line. From that the Metropolitan and District lines developed and the whole Underground system blossomed to what we now have today. But it has its limits. "In the ... financial year, ended on 31 March 2012, London Underground trains ran 72.4 million kilometres, the highest ever, and carried 1,171 million passengers, a new record." This figure is obtained without considering the numbers travelling on London Overground services, calculated at over 200.000 daily, nor those passengers on the Dockland Light Railway(DLR) services, calculated at nearly 200.000 passengers daily which means that the yearly total is about 1,315 million passengers or almost 3.65 million per day. We can add the figures for London Buses. The 8500 vehicles transported over 2,200million passengers in the period 2010-11. However, we are concentrating on rail services of one sort or another. Of course, these numbers are extremely high, but then the capital does have massive employment and does attract enormous numbers from outside the metropolitan area. Many have contacts with the government and civil service at Whitehall. Others make use of the financial institutions of the City and Isle of Dogs. Yet others have their work or have to visit the central offices of giant corporations situated in the capital. London is a tourist attraction in itself. Both foreigners and Britons come to the "Big Smoke" to take advantage of the historic sights, art and culture in general, sports and other entertainment activities, and the shopping facilities for those on a spree. The obvious should be said, also, that not everybody goes to the same place/station, and many are moving from one side of the conurbation to another. However, what most concerns us is when London is a necessary transit point. We wish to travel from Peterborough to Reading, or from Brighton to Colchester. It is then essential to travel through the conurbation even though we do not want to stop to visit there on some occasions. Many long distance passengers are forced to traverse the city when arriving from Mainland Europe - by train on Eurostar. Others fly into any one of the six airports (Gatwick, Heathrow, Luton, Stansted, Southend and City) to continue their journeys to other parts of Great Britain, by train, coach, or car. In short London is a travel "Hub" - in from outside to elsewhere outside, and vice versa. The question then arises, is it necessary for all travel connections to pass through London? The busiest LUL stations are Victoria and Waterloo with 82.96 million and 88.16 million passengers travelling through them in 2012. Liverpool Street (at 64.23 million) and London Bridge (at 67.16 million) are not far behind. Kings Cross/St.Pancras handled 80.97 million passengers but most of these were long distance passengers while the aforementioned were mostly commuters. On average 40% of passengers through the rail termini travel on by LUL services while 10% go by bus. The following question is how many of these passengers pass from one mode of transport to the other. Is it a simple arithmetic sum or are they all the same passengers? Well neither one nor the other. The average figures for onward travel from National Rail to Underground are 40%, while 36% continue their journey on foot, and 9% interchange with other rail services. These figures, however, differ greatly between the terminals with the extremes as follows. Cannon Street has 80% of rail passengers continuing on foot while at Paddington, at the other extreme, only 12% continued their journey on foot. As could be expected the use of the Underground at these stations was at opposite extremes as well with 62% of passengers using it at Paddington, while only 9% of passengers at Cannon Street used it for their onward journey. This illustration from H2 shows the capacity problems(with red lines) into London from Milton Keynes, along the WCML(West Coast Mainline), from St.Albans along the MML(Midland Mainline), and from Welwyn Garden City along the ECML(East Coast Mainline). These are major arteries (corridors) into/from the London termini. But yet again what is ignored is the fourth (artery) - The Chiltern Line. This is ignored even though the proposed (High Speed 2) HS2 runs along the same corridor. Obviously taking this line into account could change the whole conception of fast services to the Midlands. It is marginalised. Why is another question but not looked into here. 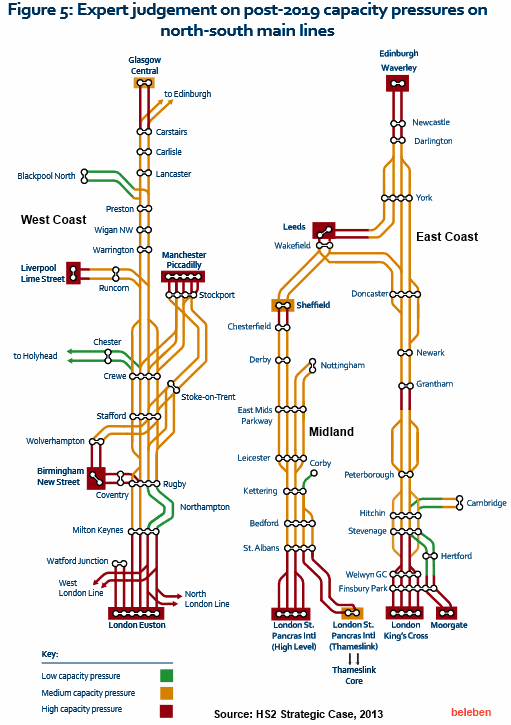 Take note, in the WCML, of the "red lines" from Rugby to Birmingham, from Birmingham to Wolverhampton, from Stockport to Manchester, in the approaches into Liverpool and from Carstairs to Glasgow Central. The same "red lines", on the ECML occur on the approaches to Grantham, on the way from Leeds to York, and most importantly from Darlington to Newcastle and Edinburgh. All, this means that the problems are not all local to London as the politicians would have us believe. The line capacity problems from Rugby to Euston exist along the WCML, but they are only part of the problem. However, they are not the only ones which they would have us believe to justify HS2. It should also be noticed that the solution to these "bottleneck" problems can be quite simple. Some can be solved by fourtracking the rail system - as at Welwyn Garden City - while others can be resolved without massive capital investment such as the extension of the Bakerloo Line services from Harrow & Wealdstone to Watford Junction, and the diversion of the Overground services, on the same line, from Euston to the south of the Thames. The London airports, Heathrow(72.4m), Gatwick(35.4m), Stansted(17.9m), Luton(9.7m), City(3.4m) and Southend(0.97m), (in descending order of passenger numbers) have their importance. However,to put things into perspective, it should be pointed out that even being the largest airport in Europe, Heathrow, had a throughput of about 72 million passengers in 2013 - that is fewer than those passengers travelling through Victoria station alone. The next largest, Gatwick, was nearly on a par with Euston station. From these airports the passengers travelled elsewhere, (a) on other flights (b) on buses and coaches to other parts of Britain (c) by car (mostly to other parts of Britain) and some (d) on train or bus into or through London. Many of these are already counted in the figures mentioned at some of the mainline stations (not all - e.g. Heathrow Express passengers are not counted). Therefore, it would be safe to conclude that the figures do not need to be treated separately. The problems at airports are others. There are a lack of slots for landings and take-offs, a lack of parking space for aircraft on the ground, some terminals cannot keep up with the growing numbers of passengers, and last but not least many parties believe, this blogger included, that there is a lack of runways in, at least, two airports. However, these problems are dealt with elsewhere. The above figures of use of the National Rail and Underground (not forgetting Overground and DLR) show the systems are widely used with some incredible numbers. They do not mention the extensive use of other stations such as Clapham Junction(23.6m. ), Stratford(25.6m) and East Croydon(21m), to mention only three. However, while the improvements are going on the system is creaking at the seams already. At busy times some LUL stations have limited access and are closed to incoming passengers. This is the case at Victoria, many times, where access is restricted to avoid dangerous overcrowding on the platforms. But Victoria is not the only case as it occurrs at other stations. This will get worse over time. Even now during (e.g. )August, a month with a lower number of workers entering Central London, but with a higher number of tourists, the tube trains become heavily overcrowded at all times of the day in Central London. How far can this go on? In the next blog we will look at some measures being taken and others which could be taken.